I grew up believing that one day I will have a church wedding or ROM. I am not even a Christian, why church? Well, it must be those romantic movies that I've watched. It created an impression that for a wedding to be romantic it has to be held in a church. But never have I expect that my own ROM to be so different and meaningful. My life changed ever since Kareshi stepped in. 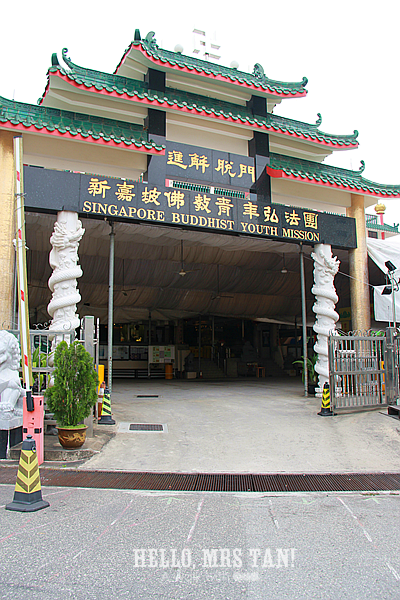 One of the biggest change would be getting to know Buddhism and the Dharma. Because of him, I've learnt to be a better person. I wonder if he knows that I enjoy listening to him talking about the teaching he has learnt. 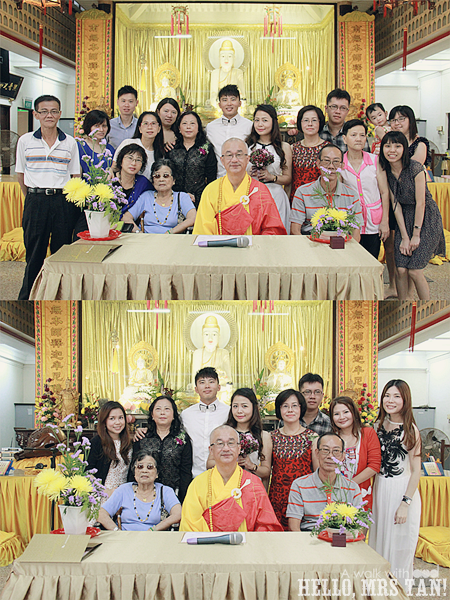 It was on 18 September 2014. 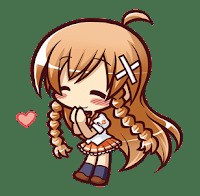 I couldn't sleep on the eve of my ROM. I guess I was too nervous. I do not what kind of feelings I had but I guess its mixed feelings. I bet mummy felt the same too. She must be thinking "Ah, my daughter finally found someone to walk the rest of her life with and now she is getting married". Never had I thought I would have such affinity with Buddha. 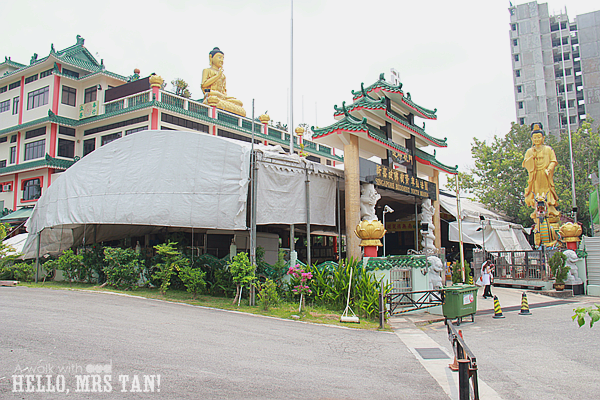 Kareshi proposed to me in front of the big Buddha (you can read it >>here<<), and now we had our solemnization at the monastery. 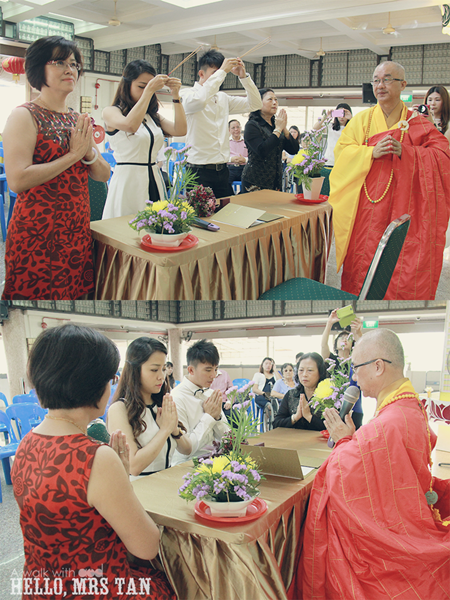 We were blessed to have Venerable Kwang Phing, the president of Singapore Buddhist Federation, to be our solemnizer. He shared with us how to be good husband and wife and how to maintain a good relationship. It is all about respect. When you respect, you will understand, you will support, and you will forgive. Putting on our wedding bands, we promise to be there for each other, to love, to support, to respect, to understand and to forgive. 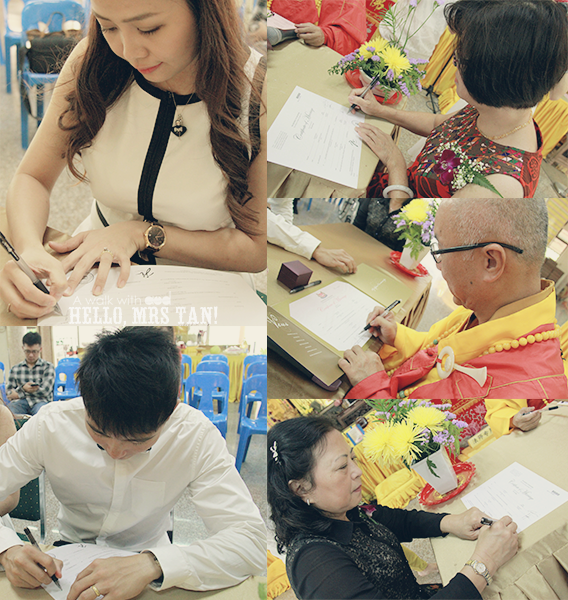 I always believe that what we've signed is not just a piece of paper but a lifetime promise that we will walk the rest of our lives hand in hand. Now, I am no longer alone. I have you right by my side and you have me. I am not perfect, and you are not perfect too but I believe we will overcome all obstacles together. Thank you mummy for bringing me up well. You did a great job but I know I still have my flaws. You sacrificed a lot to bring me up and I couldn't thank you enough. Many times I may not be as compliant as you wish and at time I make you unhappy. However I wish to tell you that I love you deeply. I do not need to have many friends. Just a handful of close friends are all I need. 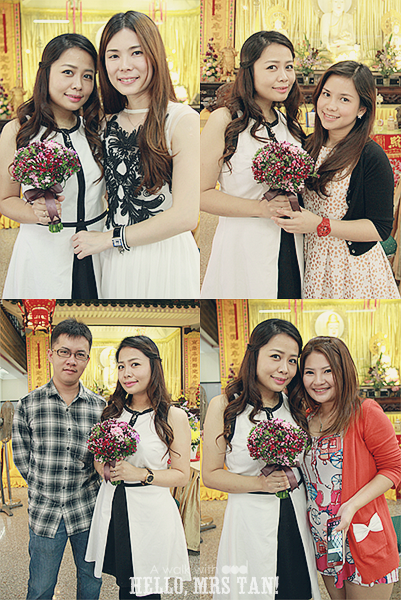 Thank you for being here with me on my big day. 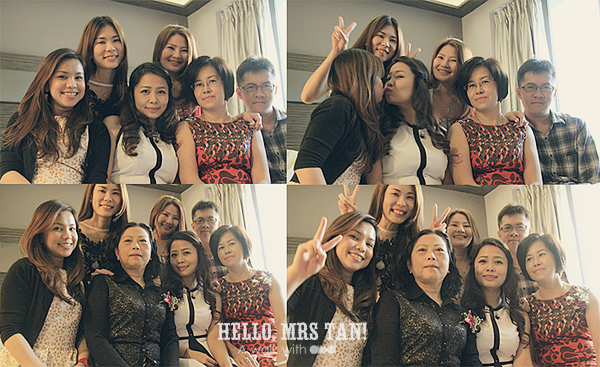 A big thank you to all who came to witness our solemnization and to share our joy. Thank you for your blessings. This is where a new family begins. 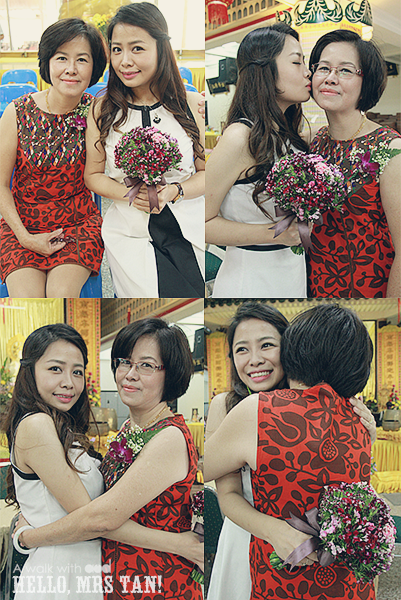 From now on, we have two lovely mummies and it will be an awesome journey. Dear Darling, Thank you for walking into my life. Thank you for all the love, care and support. I am thankful to have such a wonderful you as my lifetime partner and I will do my best to be your perfect wife. 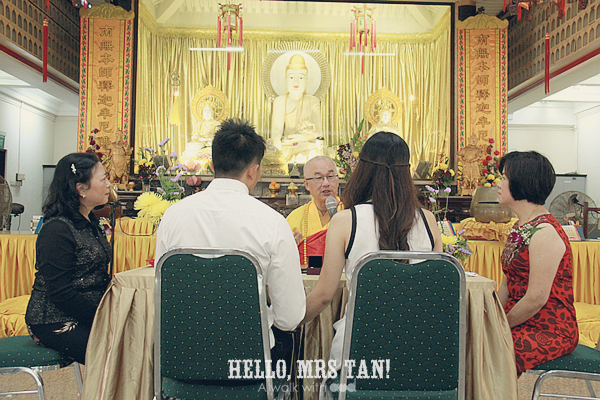 Now, say hello to your Mrs Tan! Ps: Your mummy looks so young! What a beautiful wedding! That is so cool that you got married in a monastery. Living in America, something like that is definitely not very common. 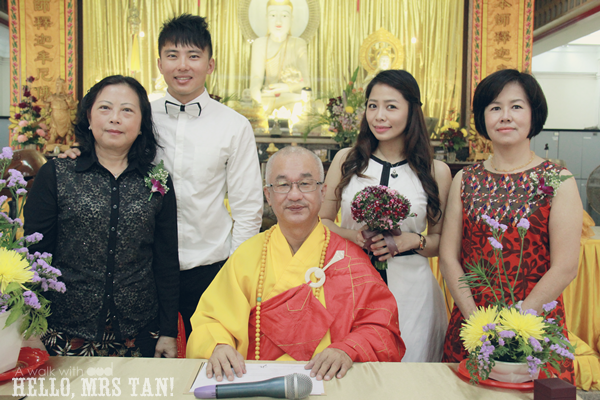 Congratulations on being the new Mrs. Tan! Thank you Kriselle! I guess Church will be the common ones right?